Phase-matching Coincident Multimics: Here's a little demonstration of the phase-alignment technique discussed in Section 7.1.1 of the book. In this example, let's say I want to mic up a guitar amp with a dual-mic coincident array comprising a Shure KSM137 small-diaphragm cardioid condenser mic and a Shure SM57 cardioid dynamic mic. I'd therefore mix the two microphone signals together at an equal level, invert the polarity of one of them, and then slowly sweep the position of one mic relative to the other (Ex07.003:WAV/MP3 ), listening for the strongest phase-cancellation effect -- which occurs about 20 seconds into the audio example. Note that if you mix those two signals without the polarity-inversion (Ex07.004:WAV/MP3 ) the tightness of the phase-match becomes much harder to judge. Balancing Instrument Facets: Multimiking is frequently used to balance different facets of an instrument's sound into a more representative whole. A common application is using a crossed coincident pair of cardioid microphones for acoustic guitar, one mic pointing towards the fretboard to capture the string character (Ex07.005:WAV/MP3 ) and one mic pointing more towards the soundhole to capture the body resonances (Ex07.006:WAV/MP3 ). These can then be blended together to taste (Ex07.007:WAV/MP3 ) with negligible comb-filtering side-effects, on account of the coincident setup. Crossed pairs are often used for miking grand piano too, as in this example where a pair of small-diaphragm cardioid condenser mics are close in behind the music stand, one pointing towards the high strings (Ex07.008:WAV/MP3 ), and the other pointing towards the low strings (Ex07.009:WAV/MP3 ). Mixing the mics together then gives a more even balance of the instrument's pitch registers (Ex07.010:WAV/MP3 ), although inevitably without a tremendous degree of low-end weight given the close-miking position close to the ends of the strings. If you wanted to bolster the coincident rig's low frequencies, you might place another mic more in the centre of the piano where the low-end is more pronounced (Ex07.011:WAV/MP3 ) and then mix that in (Ex07.012:WAV/MP3 ). The moment you use non-coincident multimic setups, however, you have to be aware that very small microphone repositionings can have a big influence on the mixed sound, because of comb-filtering between the mic signals. Take the following acoustic guitar multimic rig, for instance, where a cardioid condenser mic 30cm from the instrument just above the soundhole (Ex07.013:WAV/MP3 ) is combined with an identical mic 30cm in front of the 12th fret (Ex07.014:WAV/MP3 ) to create this composite mixed sound (Ex07.015:WAV/MP3 ). Although moving the second mic 5cm closer to the instrument (Ex07.016:WAV/MP3 ) or 5cm further away (Ex07.017:WAV/MP3 ) makes little difference to that mic's tone in isolation, its impact is much more audible on the mixed sound because it changes the phase relationship between the mics: here's the original mix again (Ex07.015:WAV/MP3 ); here's the mix with the 12th-fret mic 5cm closer (Ex07.018:WAV/MP3 ); and here's the mix with the 12th-fret mic 5cm further away (Ex07.019:WAV/MP3 ). Mixing Mics On Different Guitar-amp Speaker Cones: Here are a couple of examples of multimiking two guitar-amp speakers and combining the results. The first setup comprises two on-axis Shure SM57s, directly against the speaker grille of a Fender Twin Reverb combo, one covering the left-hand speaker (Ex07.020:WAV/MP3 ), and the other covering the right-hand speaker (Ex07.021:WAV/MP3 ). This is what those two sound like mixed together (Ex07.022:WAV/MP3 ). The second setup involves a centrally placed pair of AKG C3000 large-diaphragm cardioid condenser mics 15cm away from the speaker grille. The mics are spaced 15cm apart and angled outwards so that each focuses primarily on a single speaker. Here are the left mic (Ex07.023:WAV/MP3 ) and the right mic (Ex07.024:WAV/MP3 ) on the their own, and now the mix of both of them (Ex07.025:WAV/MP3 ). Miking An Instrument From Opposite Sides: There are some situations where you may wish to mike an instrument from opposite sides. The most common situation is where a mic over the snare drum (Ex07.030:WAV/MP3 ) and a mic underneath the snare drum (Ex07.031:WAV/MP3 ) are mixed together to give a combination of top-mic punch and bottom-mic rattle (Ex07.032:WAV/MP3 ). However, you have to be careful to check the polarity relationship between the two mics before mixing them, because one of the waveforms will usually be inverted in relation to the other, and if you don't correct this it will leave you with a gutless tone (Ex07.033:WAV/MP3 ). The same applies if you decide to dual-mic a kick drum from both sides to combine batter-head beater definition (Ex07.034:WAV/MP3 ) with resonant-head roundness (Ex07.035:WAV/MP3 ). Get the polarity relationship right and you get a useful composite of each mic's good qualities (Ex07.035:WAV/MP3 ); get it wrong, however, and you'll end up with a mixed sound that's a lot less than the sum of its parts (Ex07.034:WAV/MP3 ). Blending Microphone Tonalities Using Coincident Arrays: Coincident multimiking allows you to blend together the tonal colours of different microphone designs in a fairly natural manner, free from the unpredictable interference of comb-filtering effects. Consider this example: an electric guitar cabinet multimiked with a three-mic coincident array roughly six inches from the speaker cloth. The mics in question are a Shure SM57 cardioid dynamic mic (Ex07.040:WAV/MP3 ) a Sennheiser MD421 cardioid dynamic mic (Ex07.041:WAV/MP3 ) and an AKG C414B-XLS large-diaphragm condenser mic in its cardioid mode (Ex07.042:WAV/MP3 ). To give an idea of the tonal colours this makes available, check out this mix (Ex07.043:WAV/MP3 ) where I start with the SM57 signal on its own, and then slowly crossfade to the MD421, ending up with just the MD421. You'll hear a similar crossfade between the SM57 and C414B-XLS signals in this mix (Ex07.044:WAV/MP3 ). If you'd like to explore other combinations, import the three mic signals into your own audio system and balance them against each other for yourself. One way of getting maximum tonal range out of this multimiking technique is by choosing microphones that are very different in character. Here, for example, a rich-sounding AKG D112 cardioid kick-drum microphone (Ex07.045:WAV/MP3 ) and a thin-sounding AKG C418 clip-on electret mic (Ex07.046:WAV/MP3 ) set up in a coincident array six inches in front of the same guitar cabinet provide a broad range of different balances, as you can hear as I gradually crossfade between the two mics in this mix file (Ex07.047:WAV/MP3 ). Time-aligning Room Mics: Here's a guitar amp that's been miked up close with a Shure SM57 cardioid dynamic mic (Ex07.070:WAV/MP3 ), while an AKG C3000 large-diaphragm cardioid condenser mic picks up the room sound from roughly four metres away (Ex07.071:WAV/MP3 ). Here's what those two signals sound like simply mixed together (Ex07.072:WAV/MP3 ), although some engineers like to compensate for the time-of-arrival difference between the two mics to reduce comb-filtering interactions, as you can hear in this example (Ex07.073:WAV/MP3 ). One side effect to listen for, though, is what this time-alignement does to the sense of depth, because time-alignment of this type can make the instrument appear less 'upfront'. Sculpting Multimiked Guitar Tones With 'Phase EQ': In Section 7.2.2 I mentioned that producer Jack Douglas has a method of sculpting the tone of electric guitar overdubs -- he calls is the 'Phase EQ'. Here's the kind of setup he's referring to: two dynamic mics right up against the speaker grille at an angle, on opposite sides of the speaker cone, the first a Shure SM57 (Ex07.050:WAV/MP3 ) and the second a Sennheiser MD421 (Ex07.051:WAV/MP3 ), plus a large-diaphragm condenser mic on-axis about 30cm away, here a C414B-XLS in cardioid mode (Ex07.052:WAV/MP3 ). This file (Ex07.053:WAV/MP3 ) demonstrates four very different tonalities that I managed to achieve by combining these recordings, using nothing more sophisticated than fader levels and polarity settings. There's nothing sacred about this specific setup, though, because the same kind of tone-bending power is available to any non-coicident multimic rig -- especially where each mic signal has been selected to provide a distinct timbre of its own. So here's another multimic electric-guitar recording you can experiment with on your own system, comprising: a Shure SM7B cardioid dynamic microphone two feet from the amp, with its sub-200Hz bass cut and 4kHz presence boost switches engaged to give it quite a boxy and aggressive sound (Ex07.055:WAV/MP3 ); a Shure SM57 cardioid dynamic mic roughly 40cm from the amp and slightly off-axis, giving it an uncharacteristically warm timbre (Ex07.056:WAV/MP3 ); BLUE's unusual phantom-powered Kickball dynamic mic around 45cm inches from the amp, with its internal LF contouring switch in its central position for a nice balance between meaty low end and upper midrange crunch (Ex07.057:WAV/MP3 ); an Electrovoice RE20 cardioid dynamic mic about 60cm from the amp, towards the edge of the cabinet to capture lots of warm low midrange (Ex07.058:WAV/MP3 ); and an AKG C414B-XLS large-diaphragm condenser mic in hypercardioid mode with its low-cut filter engaged, set back from the amp about 90cm (Ex07.059:WAV/MP3 ). Now let's say I decided to start off with the C414B-XLS as the basis of my sound (Ex07.061:WAV/MP3 ), I might listen to the other mics and decide I'd like to add some 'growl' in the 700-800Hz region from the Shure SM57, only to discover when mixing the two mics together that its achieved the very opposite (Ex07.062:WAV/MP3 ), so I invert the polarity of the SM57 signal (Ex07.063:WAV/MP3 ), which improves matters considerably, although with a certain loss of low-midrange warmth. I try to mix in some of the Electrovoice RE20 signal to compensate for this, but again it does the opposite of what I'd hoped (Ex07.064:WAV/MP3 ), so I polarity-invert that signal too in order to reach a more well-balanced end result (Ex07.065:WAV/MP3 ). More On Using Speaker Drivers As Mics: Further to what I said about the low-frequency bias of speaker-based microphones on page 224 of the book, it's as well to mention that speaker drivers are also rather resonant devices, so if you take them out of a damped speaker cabinet to use them as microphones they'll tend to introduce a fixed-pitch low-frequency resonance related to the driver's inherent resonant frequency. The exact pitch and decay time of that resonant characteristic will, of course, depend on the specific speaker driver you choose, so the suitability of any given speaker driver will therefore depend upon the notes and harmonies used in the music you're recording. Broadly speaking, though, the larger the speaker cone, the lower its resonant frequency is likely to me. Affordable Multimic Mounting Hardware: A decent short stereo bar is very affordable and useful for simple coincident multimiking tasks -- the K&M 23550 shouldn't set you back more than a tenner, for instance. For more complicated multimiking rigs, I'd suggest investing in a few of K&M's 238 Microphone Holders, which will clamp onto almost any mic stand (or indeed bannisters, curtain rails, random bits of furniture) to increase the number of mics you can put up at once -- and, again, they're only a tenner a pop, which is a whole lot cheaper than buying lots of extra mic stands. Variable Phase Adjusters: Hardware phase adjustment still isn't particularly cheap, with things like the Radial Phazer and Little Labs IBP demanding a considerably investment. For this reason, many small-studio users would prefer to stick with mic-positioning and polarity reversal tools while tracking, and leave variable-phase tweaks in the software domain. 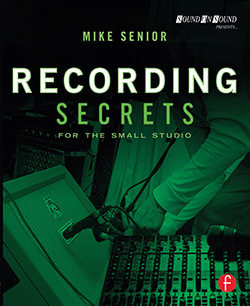 In this scenario, my top tip has to be Voxengo's PHA-979 plug-in, which I use all the time, but you can find several other suggestions here, as part of my 'Mixing Secrets For The Small Studio' resource pages. Using Loudspeaker/Headphone Drivers As Microphones: If you'd like to experiment with building your own mics from loudspeaker or headphone drivers, check out these videos for ideas: Video 1; Video 2. There's also some nice background info here. Alternatively, Solomon Mics sell a smart-looking prefab model which is fairly affordable. Guitar Tones Via Multimiking: I often use multimiking for tonal control while recording electric guitars, and wrote about one such session in this Sound On Sound magazine 'Session Notes' column. Also in the magazine's archives is this great article on guitar multi-miking from Jack Ruston called 'Bigger, Badder Electric Guitar', which has a selection of good audio examples to go with it.